This week, President Trump sat down with the leaders of the three Baltic States at the White House to discuss the Russian ‘threat’ that prevents them getting a good night’s sleep. Unreported however, was the fact that on the same day that its leader was being received in the White House, the Latvian government was decreeing that the children of its 40% Russian population must be taught in Latvian. 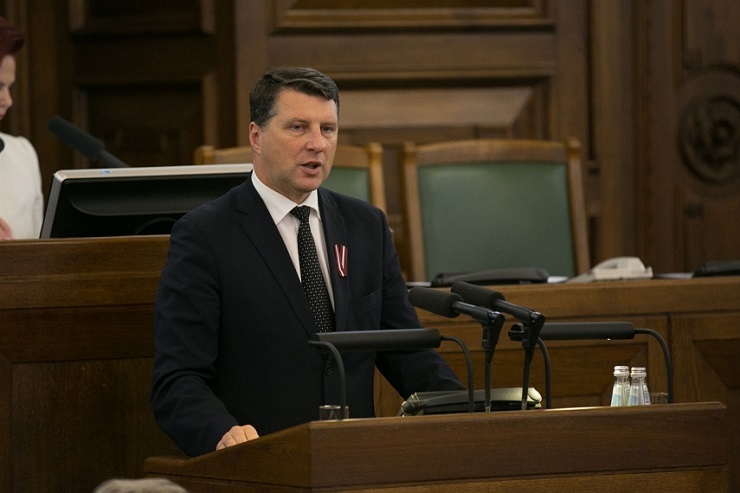 Before sitting down at the White House to complain about the so-called ‘Russian threat’ to his country, Latvian President Raimonds Vejonis signed a bill that outlaws teaching in Russian, even in schools for ethnic minorities. The only exception is Russian language and literature, or other subjects “connected with culture and history.” Latvia’s Social Democratic Party Harmony protested against the new law, saying that it contradicts both the constitution and the Council of Europe’s framework convention on protection of minorities, ratified by the Latvian parliament in 2005. Harmony called for the reversal of anti-Russian education reforms, to no avail. rules established in the majority of civilized nations.Russian lawmakers intend to appeal to the United Nations, the parliaments of European and Eurasian countries and the EU leadership, warning that the new law could lead Russia to issue a partial or full ban on financial opera-tions, increase import tariffs, restrict tourists and suspend certain bilateral trade agreements. I’m sure his Baltic guests did not tell President Trump that Russian speakers make up to 40 percent of Latvia’s 2 million population, and that all foreigners must pass a language test to become citizens. Although most non-citizens are ethnic Russians, there are also large numbers of Belarusi-ans, Ukrainians, Poles and Lithuanians. Although language requirements are common when it comes to citizenship just about everywhere, in Latvia, besides not having voting rights and being unable to serve in the military, the police, or as civil servants, Russians are also banned from being lawyers or working in pharmacies! There is no historical record of an ‘aggressive’ Russia. Russia, Poland, the Baltic princes, Sweden and Norway fought each other for centuries. In order to understand how Ukraine has come to play such an important role in all of this, it’s helpful to know that in the ninth century, the inhabitants of the vast area between Prussia and the Ural mountains invited the Viking King Ryrik (who became known as ‘Rus’) to impose order in the region. He founded a new city, (‘Novgorod), south of what eventually became St Petersburg. His successor, Oleg, moved south from Novgorod and founded Kiev, which became known as ‘Kievan Rus’. That much revered original Russian state disintegrated during the two centuries of Mongol rule, after which the Grand Dukes of Muscovy began taking over, according to a medieval theory that allowed monarchs to simply declare a transfer of power. With Kiev no longer the center of the Russian state, the territories on its western periphery coalesced into several entities which evolved into Poland, Ukraine, Belarus and the Baltics. For hundreds of years, today’s Baltic countries, facing onto the northern sea, were alternately Swedish Russian and Ukrainian principalities, as was at times, Poland. Currently, with NATO troops and tanks currently poised along the entire length of Russia’s Western border, from the Baltic to the Black Sea, the latest supine gesture of the European Union toward its master is to have agreed to strengthen its infrastructure to accommodate rapid military deployment needs. Was that also discussed at the White House meeting between the three mice and the eagle?